Chicken feet make excellent stock. The first boil cleans them up a bit. Once the claws are off, the second simmer lets all the juices out. They are also really creepy-looking, sort of like dessicated baby hands, or Gollum hands after too many years with his “Precioussssss”, or gruesome trophies out of a Joseph Conrad or Arthur Conan Doyle novel. This recipe is not for everyone, but if, like me, you are not particularly turned off by finding out what your food looks like in its pre-prepped state or are at peace with the fact that there is death and muck involved with being a carnivore, or have a leftover curiosity from the days of dissection in Biology class, well then you will love the velvety, deeply flavored results of this stock. You want to have good stock around; it will bring up the level of soups and gravies, and considering that chicken feet are free or close to free, you really should give it a go. 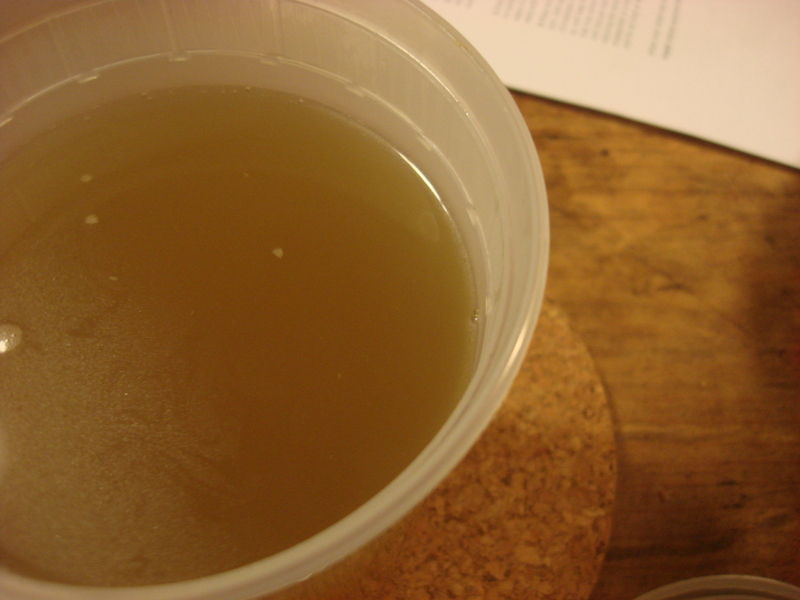 Organic stock can cost around $4 a quart, and I can’t say that it is great. I can definitely say that this recipe is great. This recipe is a combination of a Simply Recipes stock specifically for chicken feet and some advice from Zarela Martinez’ book Zarela’s Veracruz for savory chicken stock. Boil enough water to cover chicken feet. 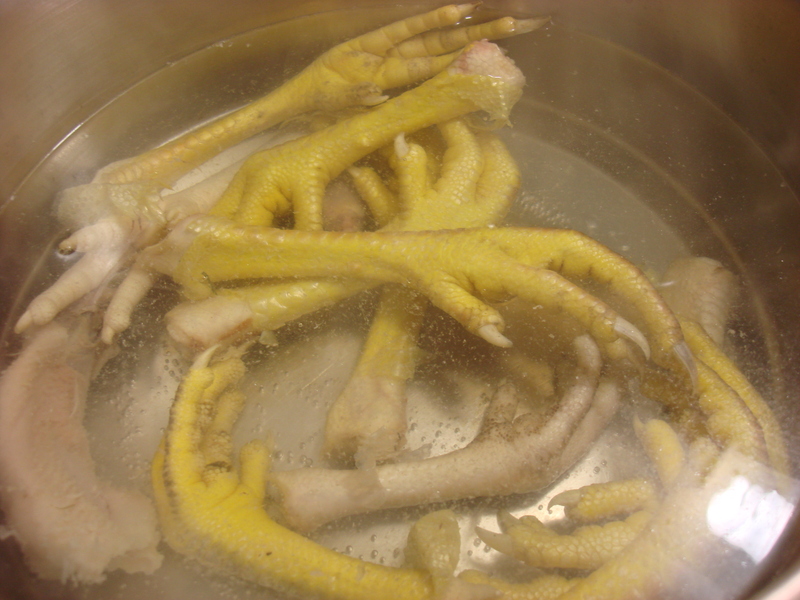 Boil chicken feet for five minutes, skimming scum off the top. Drain and rinse to cool, then chop off the claws at the first knuckle (close to the claw). Also slice off any black or unappealing bits from the pads of the feet. Put chicken feet and all other ingredients in pot with about 3 quarts of water (enough to cover by an inch or so). Bring to a boil, then reduce heat to a slow but steady simmer and cook, half covered, for three to four hours. Remove cover and simmer another hour to reduce further. Strain through a sieve lined with cheese cloth (or in my ad hoc version, with paper towel). Cool and store in fridge for a week or freezer for three months. Makes about a quart that should be pretty gelatinous. Don’t worry, it dissolves nicely into broth with some heat. I love chicken feet to eat (as you know) and I bet that stock tastes excellent. On very rare occasions the Dim Sum restaurants in London sell duck feet as well! Awesome! 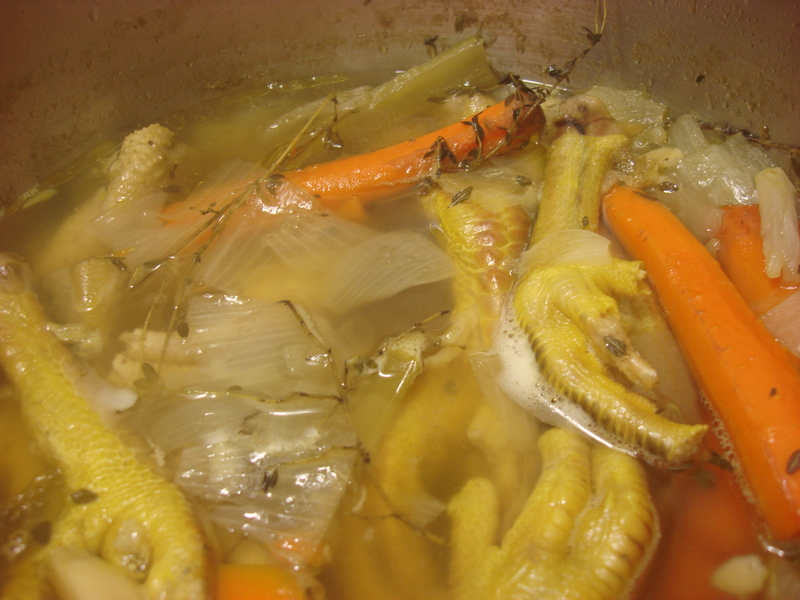 Chicken feet makes one of the best stock. There’s also pig feet, oxtail, and marrow bones. Heh heh. Oh God, in Puerto Rico there is a well-loved dish of pig’s trotters and chick peas and I think it is the grossest thing! but I would certainly make stock from them….